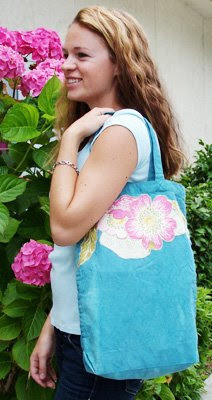 Beverly's Official Blog | News and findings from world of crafts, scrapbooking and more: Personalize a Tote Bag! This month Beverly's has a Natural Tote on sale for just $2.97 - and look what Sarah did with hers..... super cute! She used Rit dye (which is also on sale) and created her own appliqué with fabric and Stitch Witchery. Here's the other side where she used stencils and fabric paint to totally customize it. Thanks for sharing Sarah!